Water in the American West is sprayed from ornamental fountains, recycled through human made waterfalls, and generated as ocean waves in land-locked wild water oases. A charitable visitor might believe water is plentiful. Yet aridity is inescapable, at least in the Great Basin, which includes portions of Idaho, Nevada, Oregon, and Utah. Faced with the vastness of brown mountain ranges and a horizon tainted with industrialized air, we can no longer sustain the illusion of plentiful water. The urban and agricultural areas located in this Great Basin region of western Nevada depend primarily upon unpredictable snow pack in surrounding mountain ranges and on rivers that flood or, at times, run dry. 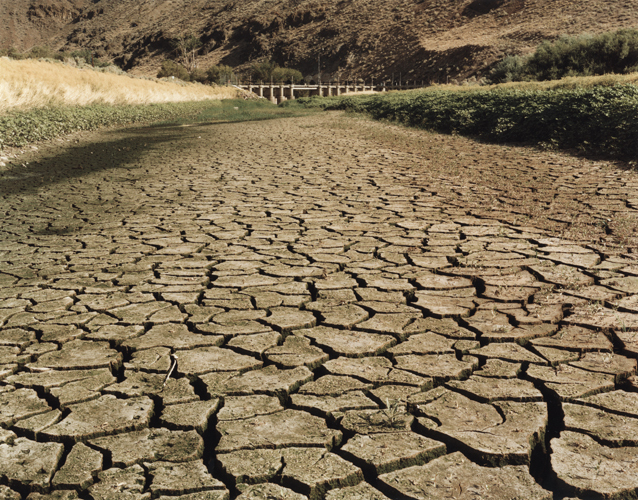 While western states' populations grow at phenomenal rates, the ancient and irreplaceable waters in the aquifers are depleted to serve the ever-increasing thirst of new development. The Truckee River, a modest and shallow river on the eastern slope of the Sierra Nevada, like many other western rivers, has been over-subscribed for decades. This river, the life-support for more than 300,000 people living in western Nevada, is threatened by an annual increase in urban population, measuring consistently at nearly eight percent. The Truckee River was the first western river to be altered by the U.S. government for irrigation. The Truckee River is dammed, diverted, and divided to quench the thirst of its many users: recreationalists and power generators in Nevada and California, the Pyramid Lake Paiute Tribe, residents of the Truckee Meadows, farmers in western Nevada, and state and federal fish and wildlife agencies. Derby Dam, which diverts the Truckee, was built in 1905. This visually modest dam is steeped in symbolism, since its origins can be found in the Jeffersonian ideal of an agrarian democracy. The federally-funded Newlands Project, as this irrigation scheme is known, inaugurated a century of dissension and turmoil despite its publicly stated noble intentions. 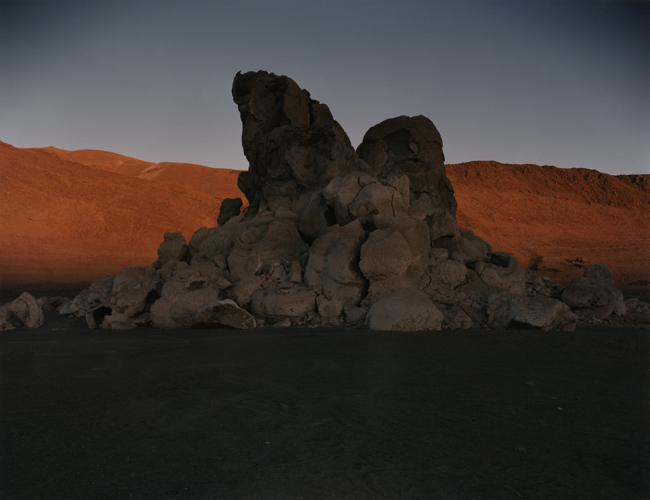 As the Jeffersonian premise of 160 acres--to provide food, shelter, and prosperity--encountered the alkali landscape, the harsh reality of desert farming emerged. Selenium salts and arsenic drain from irrigated lands into the Stillwater Wildlife Refuge, threatening this major Pacific flyway. Poor soil characteristics limit crop choices, regardless of water volume. Dry years reduce agreed upon allocations, regardless of need or legal standing. 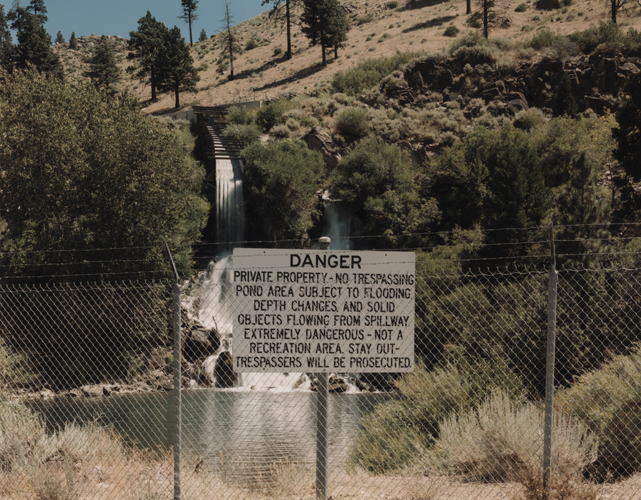 “No Trespassing.” Danger sign along Truckee River at spillway west of Reno. 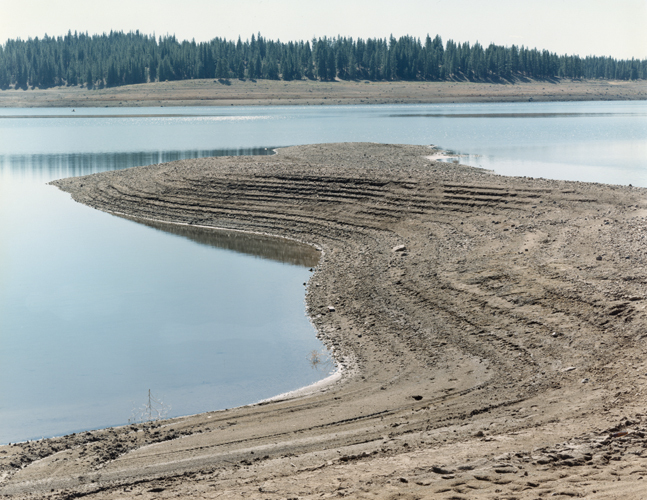 Stampede Reservoir. The U.S. Bureau of Reclamation built this reservoir in 1970. It impounds up to 226,500 acre-feet of water and is primarily used to store water for Pyramid Lake and for flood control. The Crystal Peak Fire. 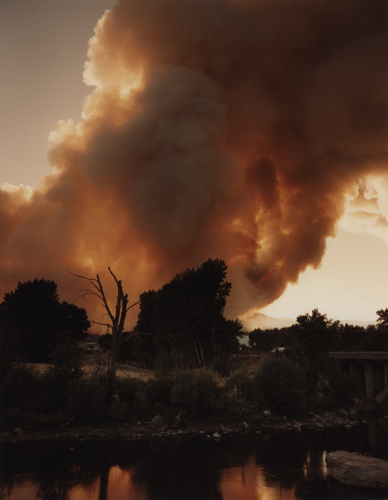 A contractor for the National Forest Service was using a ground clearing machine and sparked a fire near the Stampede Reservoir on Thursday, August 4, 1994. Within six hours, the blaze spread to the east, endangering the town of Verdi along the California-Nevada border. This fire, named for nearby Crystal Peak, burned more than 6,000 acres, destroyed three homes, and cost in excess of $7 million to fight. This view looks to the northwest along the Truckee River corridor toward Verdi when the fire was most dangerous. The Robert L. Helms Construction Company used the pit in the 1960s to excavate sand and gravel. Nearby (and just north of the Truckee River) is a tank farm used by ten pipeline, railroad and oil companies to store diesel and jet fuel. In 1987, the state Environmental Protection Agency first became aware of an oil slick flowing from the tank farm and the adjacent rail yard. The 250-foot-wide slick lay on top of underground water and was seeping into the 120-foot-deep gravel pit to the east of the tank farm. In addition, the pit is located atop a huge aquifer underneath the city of Sparks. The flow of the aquifer shifted to the northwest, toward the pit and past the tank farm. 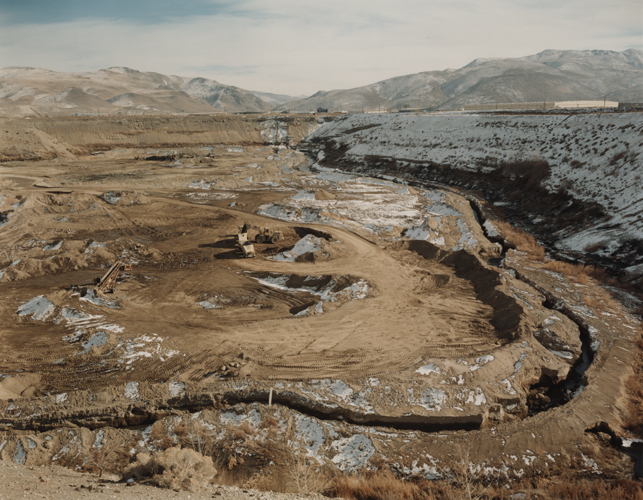 Only this reversal of the aquifer’s flow kept the seepage in the Helms Pit, where it formed a slick on water at the bottom of the pit and prevented the oil from reaching the Truckee River. The oil had to be removed, costing at that time $30,000 a month. The New Year’s Day Flood of 1997 caused floodwaters from a nearby ditch and the Truckee River to flow into the pit, eroding the roadbed under the westbound section of Interstate 80. More than 500 million gallons of floodwater raised the level of the water nearly to the rim. Helms ultimately turned the pit over to the city of Sparks, which developed the Helms Pit into a lake, marina and recreation area. 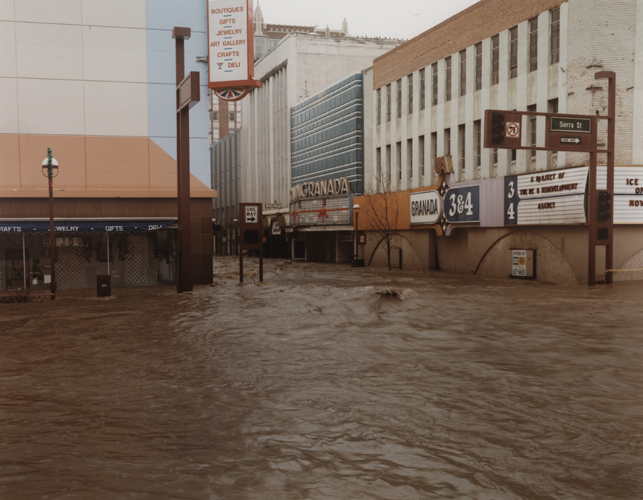 January 1997 flood. View looking down First Street at Sierra Street, Reno. This movie theater has since been torn down, replaced by a new theater complex. Demolition of the historic Mapes Hotel, Reno, January 30, 2000. The Mapes Hotel, located on the north bank of the Truckee River, crumbles after its planned demolition on a clear, windless Sunday. 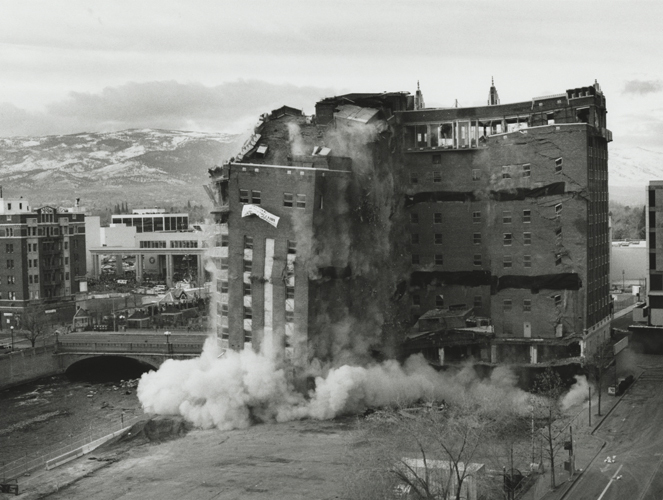 Bricks, debris, and an accumulation of eighteen years of dust were imploded after the City of Reno decided to level the hotel. The historic twelve-story Mapes, which opened in 1947, ushered in the era of modern gambling with Reno's first high-rise casino. The Mapes offered lodging, fine dining, and entertainment in the hotel's top-floor Skyroom. Locals remember the Mapes's spectacular views and the many Hollywood stars that stayed there. Marilyn Monroe and Clark Gable both resided at the Mapes during the filming of The Misfits. The Mapes closed in 1982, unable to compete with newer, larger casino-hotels. Years of contention followed, dividing city residents about what should be done with the hotel, which was located on prime development property next to the Truckee River in downtown Reno. The Mapes was named to the National Register of Historic Places in 1984, and preservationists campaigned to restore the architecturally significant art-deco building. In 1996, the Reno Redevelopment Agency purchased the Mapes and solicited bids for renovation, but all proposals were eventually rejected because of their cost – the hotel would have needed more than $25 million worth of rehabilitation, from asbestos removal to correcting structural defects. Meanwhile, the City of Reno had begun to focus its redevelopment efforts on sites along the Truckee River. In late 1999, despite heated local opposition from preservationists and citizens who opposed the loss of this historic link with Reno’s past, the City of Reno ordered the demolition of the Mapes. Artistically and historically valuable artifacts were removed from the building, including the art-deco sign bearing chaps-clad cowboys forming the M in Mapes and some of the floral-patterned concrete squares that decorated the building's exterior. Imploded by carefully set charges inside the building, the Mapes came down easily in only seven seconds, raising an impressive cloud of dust and sending bits of debris into the Truckee River. Cracked mud and Derby Dam, Truckee River. 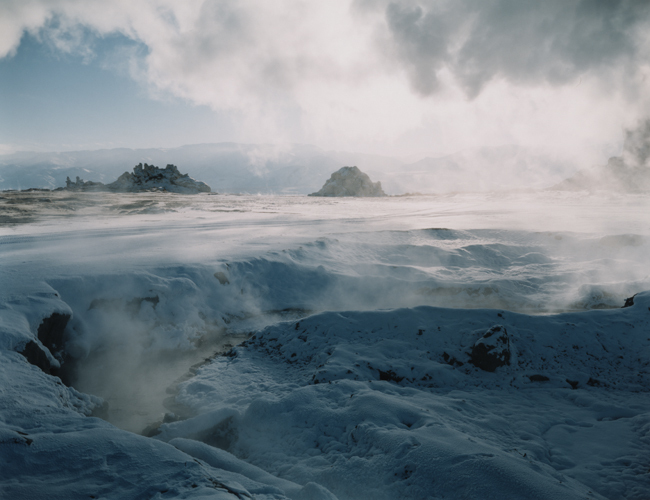 Hot Springs at the Needles, Pyramid Lake. Tufa structure near the Pyramid, Pyramid Lake. 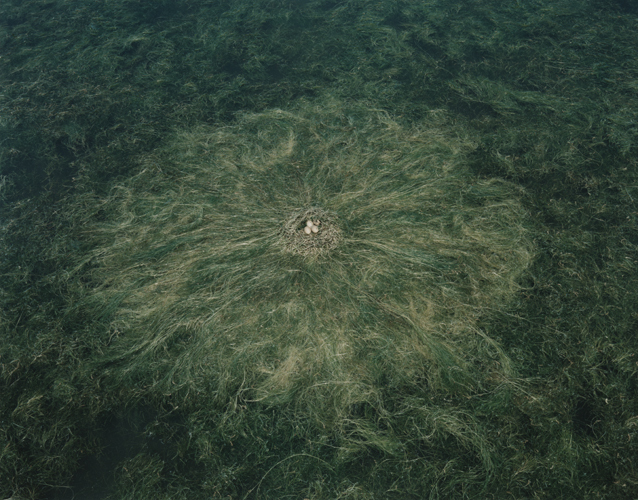 Eared grebe nest and spiral grass, Goose Lake, Stillwater National Wildlife Refuge.